And on I go into the world of Organic Cotton. In a lot of ways it is a much harder search to find organic prints, there simply isn’t as much to choose from. I’ve been really fortunate to be looking at the right time and have found some great retro inspired prints to choose from. Birch Fabrics has put out a beautiful line called Circa 60 Beach Mod collection Designed by Monaluna. 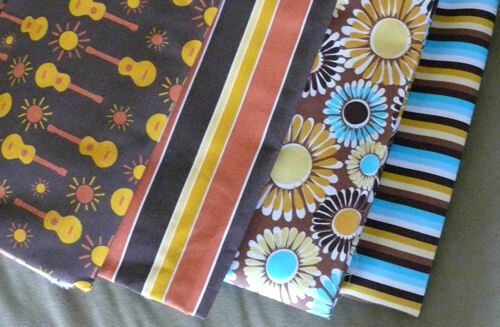 I’d love to work with more of the prints from this line, but for now I’m working with ukeleles and sunset stripe. All of thier cotton is 100% organic, GOTS (Global Organic Textile Standard) certified, it is printed with low-impact dyes (AZO-free). The other two fabrics are from the Free to Grow line by Nancy Mims for Mod Green Pod (for Robert Kaufman) in the “spring” colour pallette. They are also 100% organic, GOTS (Global Organic Textile Standard) certified, and Organic Exchange 100 Standard (I will have to look into what this means more…). They are printed with low-impact reactive dyes, IMO (Institute for Marketecology) certified(I will also be exploring this further). ~ by Stephanie on June 2, 2011. I find the input of all the information on the fabrics so interesting and hope all of the new items you create from the organic materials will have a quite a large area in your new location wether it is on the net or in a store. I love seeing all of your new creations. Thank you! I find it all very fascinating as well!